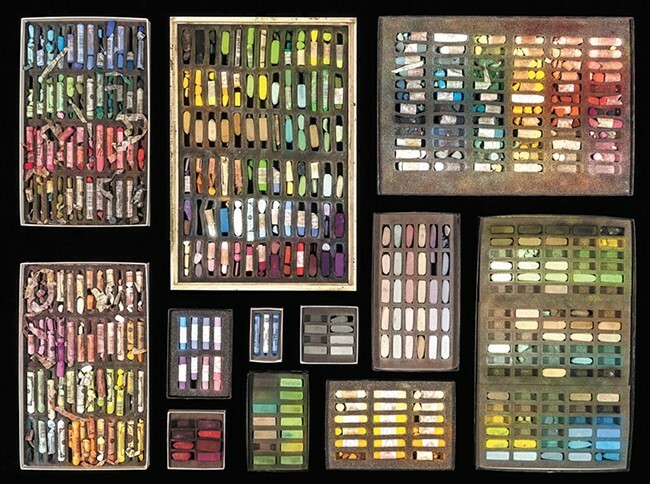 Pastels owned by Spokane artist Sheila Evans, featured in The Artist's Palette: Through the Lens of Dean Davis. This Sunday, June 28, two exhibits currently on display at the Northwest Museum of Arts and Culture are coming to a close. But, the museum has a few new exhibits on the schedule for the rest of the year, featuring art from near and far. One of the two closing exhibits is Past Forward: Contemporary Art from the Emirates. Comprised of 50 artworks including paintings, photographs, sculptures and films by 25 Emirati artists, this exhibit is a reflection of how the United Arab Emirates has approached economic development over the last 40 years, while also maintaining its people's tradition and heritage. Director of Museum Experience at the MAC, John Andrew Moredo-Burch says the exhibit is only being featured in a handful of U.S. cities. After its run in Spokane, Past Forward make two more stops before returning to Dubai. Also closing after a seven-month run is The Artist's Palette: Through the Lens of Dean Davis. For the collection, the Spokane-based photographer captured the palettes of two dozen artists, all who have a connection to the Inland Northwest. Some photos are displayed alongside a piece of art by the featured artist to show the connection between the palette and the finished piece. Though two exhibits are closing, there will be new art filling the two gallery spaces soon. Moredo-Burch says replacing one of the current exhibits will be works from Saranac Art Projects, a local, non-profit artist cooperative that brings together artists and curators in the Inland Northwest. The new exhibit is set to open on July 24, running through the middle of September. Following that, the MAC welcomes the Spokane Watercolor Society from Sept. 30 to Oct. 29 for a juried show that is open to all watercolor artists. And from Nov. 14 to Feb. 7, 2016, New York artist Sean Kenney's exhibit, Nature Connects, comes to the MAC. Nature Connects is a series of works made from Lego toys. Kenney's art includes portraits, home decor and sculptures, all made from the tiny, plastic pieces.